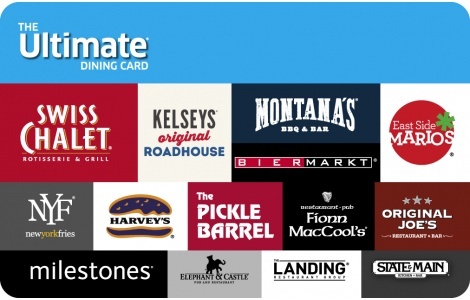 The Ultimate Dining Card is valid at any participating Swiss Chalet, Milestones, Montana’s, Kelseys, Harvey's, Bier Markt, East Side Mario’s, New York Fries, Fionn MacCools, D’Arcy McGee’s, Paddy Flaherty’s, Tir nan Og, Original Joe’s, Elephant & Castle, State & Main, The Landing Group of Restaurants and Pickle Barrel locations across Canada. That means there are over 1,000+ locations across Canada waiting to welcome you and your friends or family for lunch, dinner, or drinks! Visit cara.com to find a restaurant location near you. Use of this card constitutes acceptance of the following terms and conditions. Treat this card as cash. Card may only be used to purchase food and beverages at any participating restaurant on the front of the card as well as: D'Arcy McGee's, Paddy Flaherty's, Tir nan Og and the Landing Group of Restaurants. This card cannot be refunded or redeemed for cash, except where required by law. This card is only redeemable in Canada. Purchase amount will be deducted from the unused balance remaining on the card, with any excess purchase price payable at the time of purchase. Terms and conditions may be changed at any time, without notice. If the card is lost, stolen, or used without authorization, it cannot be replaced (unless it's been registered for balance protection at ultimatediningcard.ca). For balance information and updated terms and conditions visit ultimatediningcard.ca. Issued by Cara Operations Limited and its affiliates. Fully customize a Visa® Reward Card with your logo or send Virtual Visa Reward Codes to your customers.